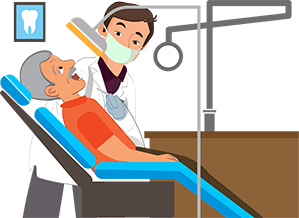 Failing to treat a dental problem at the earliest could lead to aggravation of the case and in some situations, may even result in other health concerns or diseases. For example, a root canal treatment must be done immediately if your tooth has decayed or has been damaged. If left untreated for a long time, it can lead to much more severe consequences such as airway blockage that can be life-threatening. In such cases, only a specialised dentist will be able to help and treat you. At Apollo Clinic’s Dentistry Centre, we understand the importance of oral and dental health and therefore, provide world-class services that help you recover faster and enjoy a better life. A root canal is a treatment that helps repair and saves the severely damaged or infected tooth instead of removing it. During a root canal procedure, the nerve and the pulp are removed, and the inner area of the tooth is cleaned and sealed. Without proper treatment, the tissue that surrounds the tooth will get infected, and abscesses may form. Decades ago, such treatments were quite painful. However, with advances in the dental field and local anaesthetics, this procedure is quite simple and less painful today. Root canal treatments are highly successful, and the procedures have been said to have more than a 95% of success rate. Many teeth that are fixed with root canals can last you a lifetime. There are quite a few alternatives to a root canal such as tooth extraction that can be replaced with a bridge, a removable partial denture or an implant that helps restore the chewing function and prevent the other teeth from shifting. These alternatives are not only expensive but also require much more treatment time and additional procedures. At Apollo Clinic’s Dentistry Centre, we understand the importance of oral and dental health. Our service profile includes consultation with a specialised dentist who can help your overall dental and oral health, diagnosis and treatment. With branches all across the country, you can be assured that Apollo Clinic will be there to help you at every stage in your life, no matter where you go.